Callum Smith: "I will fight with any of the other world champions and I think the fight with Gilberto should be pretty simple to make." WBO super-middleweight champion Gilberto Ramirez eased to victory after stepping up to light-heavyweight! Gilberto Ramirez secured an impressive stoppage victory over Tommy Karpency to keep himself in line for a potential super-middleweight unification clash with Liverpool's Callum Smith. Ramirez, the reigning WBO super-middleweight champion, stepped up to 175lbs and dominated the durable American from the opening bell at the Staples Center in Los Angles. The Mexican targeted the body with heavy shots and had marked his fellow southpaw's face by the end of the first round. Karpency tried to fight back in the second but his swinging shots found only thin air and by the end of the next his face was blooded. After a one-sided fourth round, Karpency's trainer and father pulled him out of the fight due to a suspected broken rib. 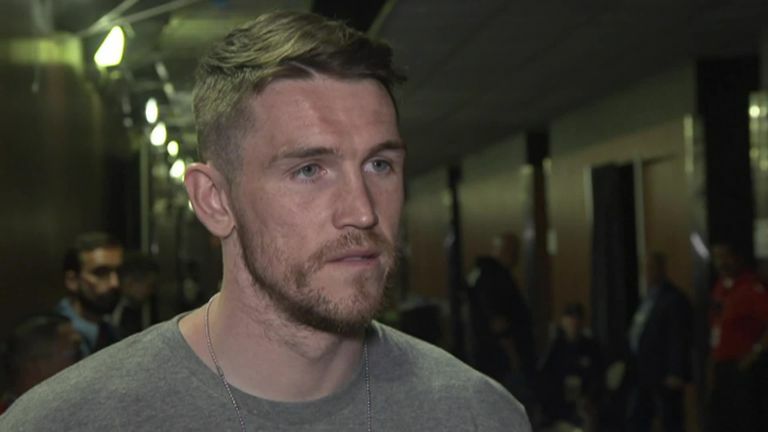 Callum Smith is targeting a unification fight with Gilberto Ramirez after the Mexican comfortably beat Tommy Karpency. WBA champion Smith, who was ringside as Ramirez claimed his 26th stoppage to extend his undefeated record to 40-0, told Sky Sports he was keen to test himself against the 27-year-old. "Yeah, I would like the fight," said Smith. "I've become a world champion and now the plan is to become a unified world champion. "I will fight with any of the other world champions and I think the fight with Gilberto should be pretty simple to make." Barboza Jr throws a beautiful right hand-left hook combo to knockout Alvarado in the third round of their clash in LA. 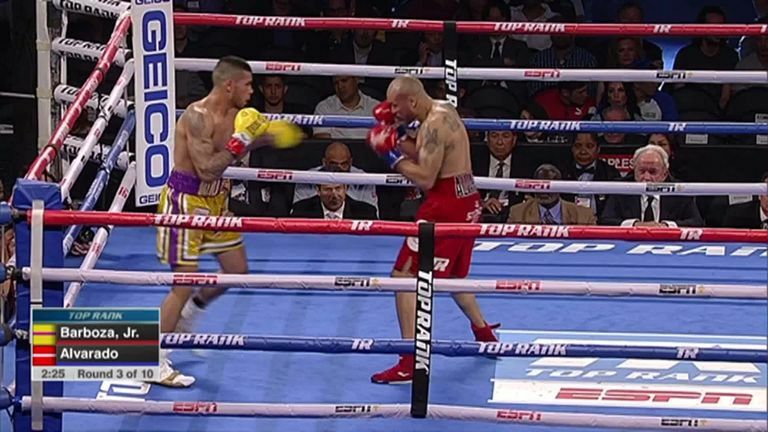 Undefeated super-lightweight Arnold Barboza Jr knocked out former world champion Mike Alvarado in three rounds to extend his record to 21 straight wins. Barboza stunned Alvarado early in the third with an uppercut before dropping his fellow American with a right hand, left-hook combination. The 38-year-old veteran made it to his feet at his second attempt but after stumbling across the ring referee Thomas Taylor abandoned his count.